Leading investigators in their fields present a broad perspective of recent major research trends in synthetic fluorine chemistry. 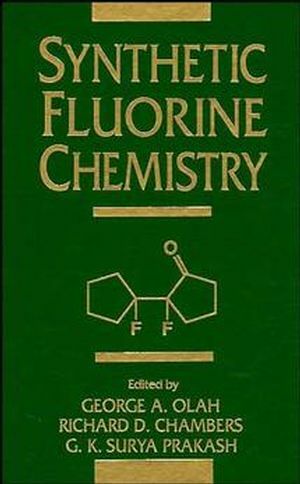 Coverage includes: various aspects of organic and inorganic fluorine chemistry, fluorination methods, organometallic fluorine chemistry and its use in synthesis, the synthesis of perfluoropolyethers (an extraordinary class of new fluorinated compounds) and much more. GEORGE A. OLAH, PhD, - 1927 -2017 - was awarded the 1994 Nobel Prize in Chemistry for his work in hydrocarbon chemistry. Professor Olah was Director of the Loker Hydrocarbon Research Institute at the University of Southern California in Los Angeles. His research focused on the generation and reactivity of carbocations via superacids. Lewis Acid Properties of Fluorinated Noble Gas Cations (G.Schrobilgen). Controlled Replacement of Fluorine by Oxygen in Fluorides andOxyfluorides (K. Christe, et al.). Transition Metal Derivatives of Strong Protonic Acids andSuperacids (F. Aubke, et al.). Fluorine Stabilized Carbon-Sulfur Multiple Bonding (K.Seppelt). A New Synthetic Procedure for the Preparation and Manufacture ofPerfluoropolyethers (R. Lagow, et al.). Universal Synthesis of Perfluorinated Organic Compounds (J.Adcock). Electrophilic Fluorination Reactions with F2 and Some ReagentsDirectly Derived from It (S. Rozen). Fluorination with Onium Poly(Hydrogen Fluorides): The Taming ofAnhydrous Hydrogen Fluoride for Synthesis (G. Olah & X.Li).